The thermostat that I've had installed is a Honeywell (I'll update with model number this evening) that allows my utility to increase the temperature (or decrease the amount of air conditioning) during hot days in the summer when the grid is labouring under it's load. They say they'll increase the temperature by one or two degrees during the day at those times. This results in less higher cost imports of power into the Ontario grid. 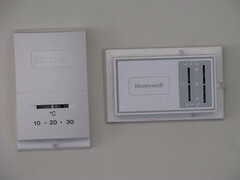 The thermostat was installed by a Honeywell technician, who also had to install a relay at my furnace to ensure there was enough power provided to the new unit. The unit has a wireless radio that connects via a pager-like network (I'm still trying to figure out what bands, etc.) to the utility who can then adjust it's programming. 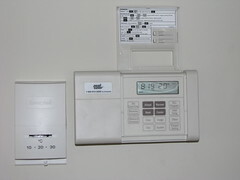 The bonus to me as an end user is that I can also program my thermostat by way of the internet which is kind of neat, and leaves me feeling 'hyperconnected'. The utility apparently adjusted their deployed thermostats only 2-3 times last year, so I don't imagine it will really effect I and Meg's lifestyle a lot. But we do see the environmental benefit, and the programmable thermostat was free and something that I've just never gotten around to purchasing. It will save us money in the winter and allow the house to be cooler during the night in the summer (which has been a manual process up to this point). Throw in a $25 credit on my electricity bill and free installation and it was simply too good of a deal not to take. 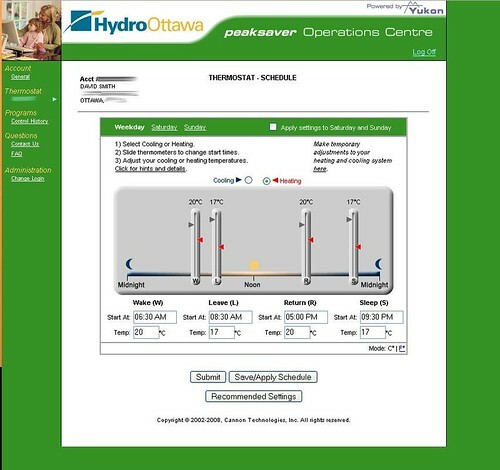 If you're interested in the PeakSaver program in Ottawa, you can apply here: Hydro Ottawa PeakSaver. Submitted by Whatever (not verified) on Thu, 2008-02-14 21:27. They sent me some crap in the mail telling me they will come to install it in my condo. Well, dumbassess - I have electric heat, and no "central" air conditioning. So good try Ottawa...raise our taxes some more. Submitted by kevin@haggaret.com on Tue, 2008-02-19 15:55. After reading this Dave, I decided to sign up. I just want the ability to remotely control the temperature in my house - like for the times when I go on vacation and forget to turn down the heat. Website said someone will be contacting me in the next 5 days. Cool! Submitted by Nalini (not verified) on Wed, 2012-08-01 17:45. Can you please tell me the model number of the new thermostat you had put in? Pls email me. Submitted by M.B. @ Smart Thermostat Guide (not verified) on Fri, 2014-01-17 00:10. Looks like it's been a few years since you got it - how'd the new thermostat work out? Did it save you any money off your energy bill? Submitted by monty (not verified) on Fri, 2015-10-02 17:19. Submitted by Anonymous (not verified) on Wed, 2015-12-16 03:26. I meet this article in the search of thermostat, Can you tell me the model number of the new thermostat you had put in? Submitted by Tom (not verified) on Fri, 2016-05-13 07:57. This one is not a new thermostat now, it is nest or ecobee that is the best one today.